Something sparkling was in order, and I spotted a Mionetto Sergio Rosé, a crisp blend of 70% Labroso and 30% Lagrein. Those readers familiar with the ubiquitous “Il” Prosecco may be questioning this wine’s unusual quotient, but rest assured the Sergio Rosé is a very small batch sparkler the winemaker “makes for his wife,” as I recall the lively sommelier explaining. Unusual or not, the aroma and flavor of ripe strawberries instantly charmed me. 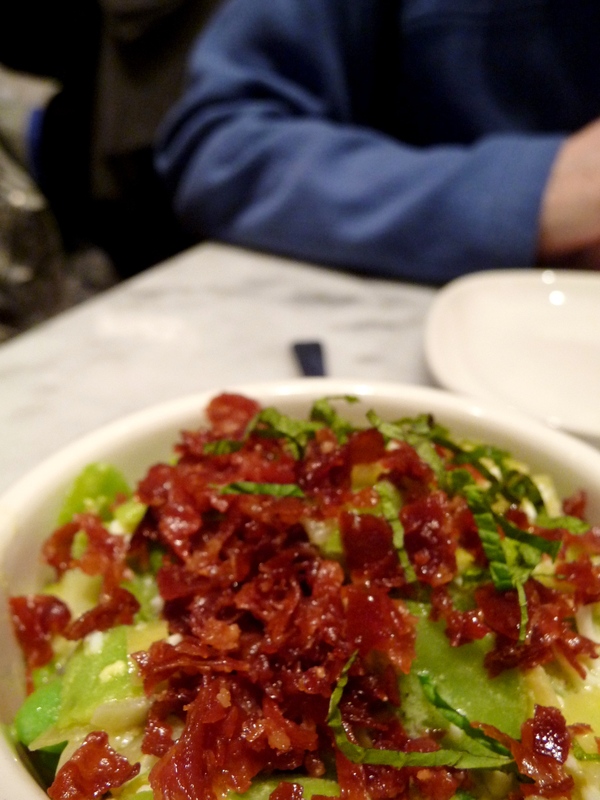 Our first course of fava beans with leeks, hard-boiled eggs and crispy prosciutto (above left, $7) offered bright, complex flavors, and it paired delightfully with the fruity Sergio Rosé. My dining companion pointed out that the dish featured low notes from the beans and prosciutto and high notes from the leeks and lemon, and the wine filled in the middle. The charred cauliflower (above right, $6) with toasted breadcrumbs, cornichons and parsley became surprisingly addictive. 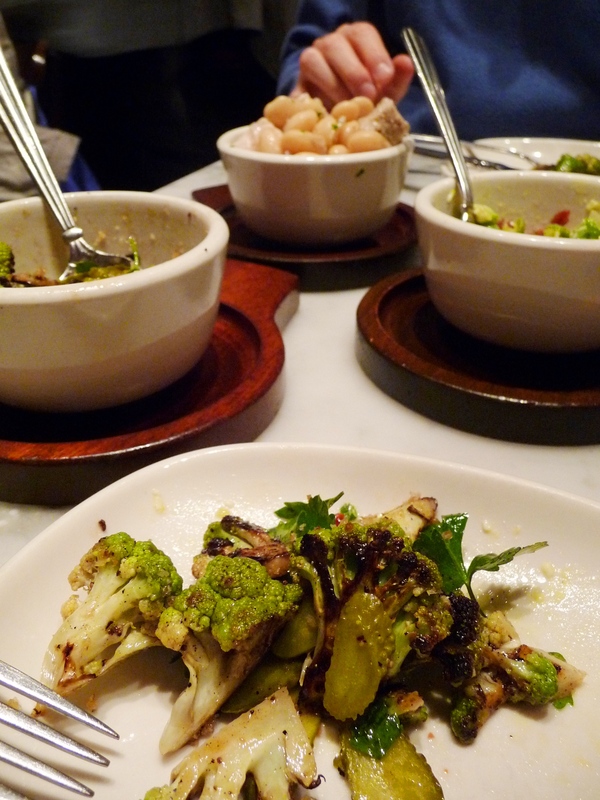 The mild, beautifully thin slices of cornichon complimented the smokey, vegetal cauliflower perfectly, and again, the Sergio Rosé made a fine pairing, as good sparklers so often do. We sampled one more dish from the “Antipasti” list, the olive oil-poached tuna with Greek lima beans (above right background, $7). Fresh tarragon and shaved fennel enhanced the perfectly fresh chunks of tender tuna, and the huge beans were a delight. We ordered round two of wine, opting for a 2009 Raventós i Blanc Perfum de Vi Blanc, a blend of 60% Macabeo and 40% Muscat from Spain’s Penedes region, and a 2007 Alpha Estate Axia, a blend of 50% Xinomavro and 50% Syrah from Macedonia in northern Greece. The Raventós i Blanc presented a beautiful honeysuckle nose, ripe pear flavors and a stony finish. I have a weakness for aromatic whites that lead you to believe they’ll be cloyingly sweet but end up to be fruity, minerally and dry. My dining companion’s Axia reached another level entirely, however. After taking a sip, and then another, he sat back and remarked, “I don’t know why, but I feel like I’ve just smoked a cigarette.” Perhaps it was the Axia’s dark, voluptuous fruit and days-long finish. Notes of tobacco and wood kept it grounded and added complexity. It was delicious paired with our next course. 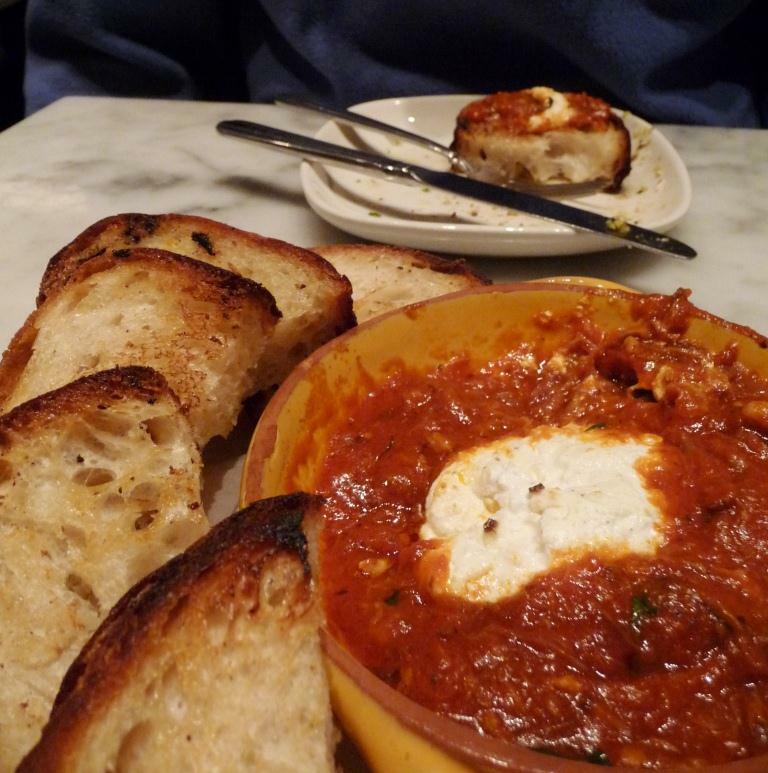 The Purple Pig’s pork neck bone gravy with ricotta (above, $9) took the standard goat-cheese-baked-in-tomato-sauce recipe and turned it into something memorable. The pork neck element gave the tomato sauce a rich, satisfying depth, like a well-made Bolognese. It’s hard not to feel good when you’re eating something like this. 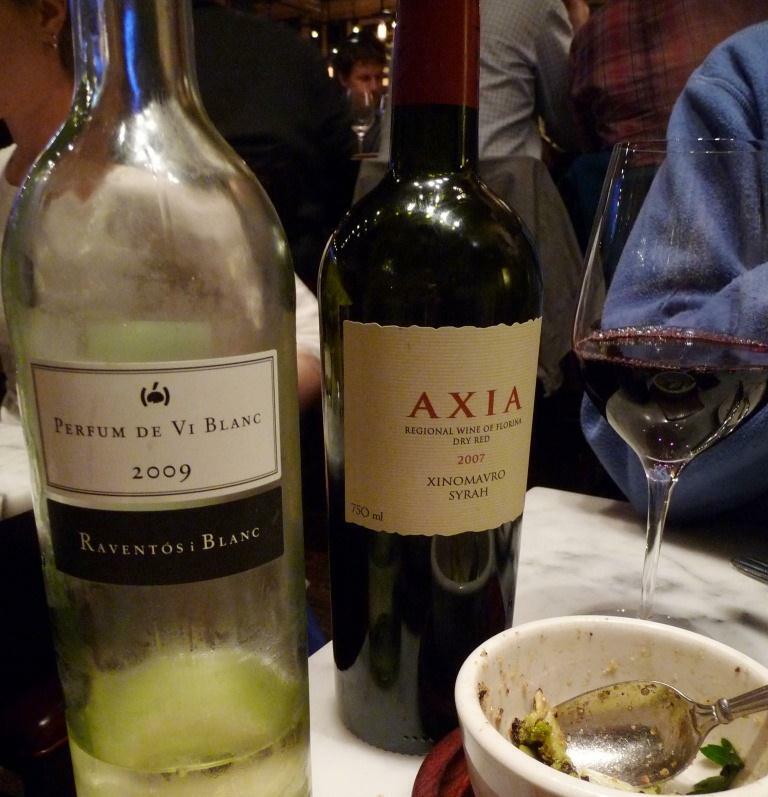 After ordering the pork saltimbocca with rainbow chard (left, $12), I asked our wine-savvy server to recommend a Portuguese red to go with it. She selected the 2008 Veedha, a blend of Touriga Nacional, Tintoa Roriz (Tempranillo), Touriga Franca and Tinta Barroca from the Douro Valley. (These four varietals are some of the most common found in Port wine.) I loved its bold, rich, fruity and spicy flavors. 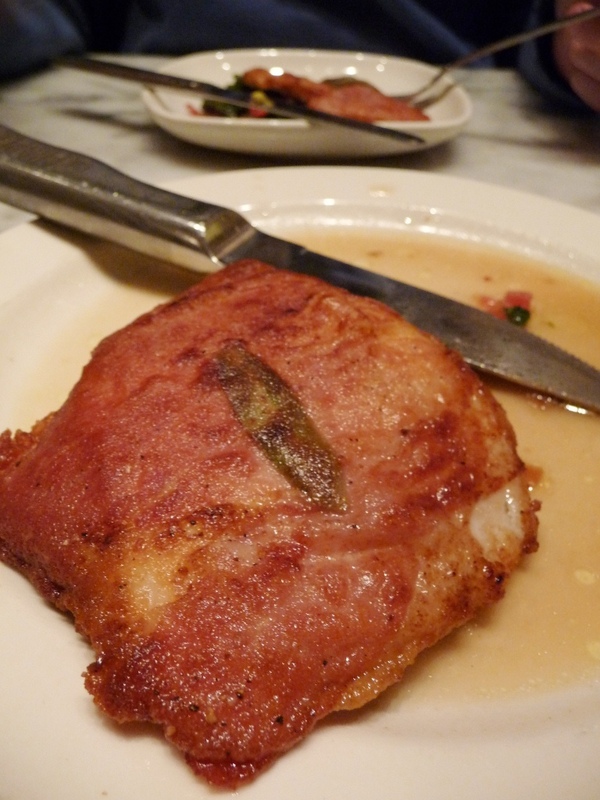 With the pork saltimbocca (a cutlet sautéed in sage-infused butter and wrapped in prosciutto), additional notes of vanilla came to the fore. Our server’s recommendation for my dining companion, who gave her no geographic restrictions, worked wonders with the saltimbocca. 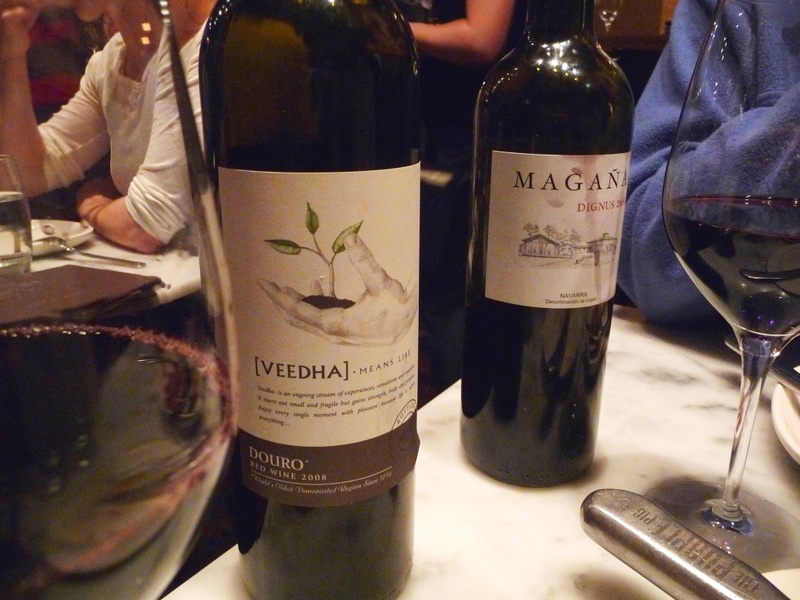 The 2005 Bodegas Magaña Dignus, a blend of Tempranillo, Merlot and Cabernet Sauvignon from Spain’s Navarre region (near famed La Rioja), tasted huge with the pork. Big fruit, big spice and a big finish made this wine a star of the evening. At this point, the chef, Jimmy Bannos Jr., thoughtfully took the time to stop by our table to greet us and make sure we were enjoying everything. Trying to sound as sober as possible, we assured him that we most certainly were: Oh yes, fantastic. That pork neck stuff — magic in a bowl. Just great. Even after our effusions, he gamely allowed me to take his photo. 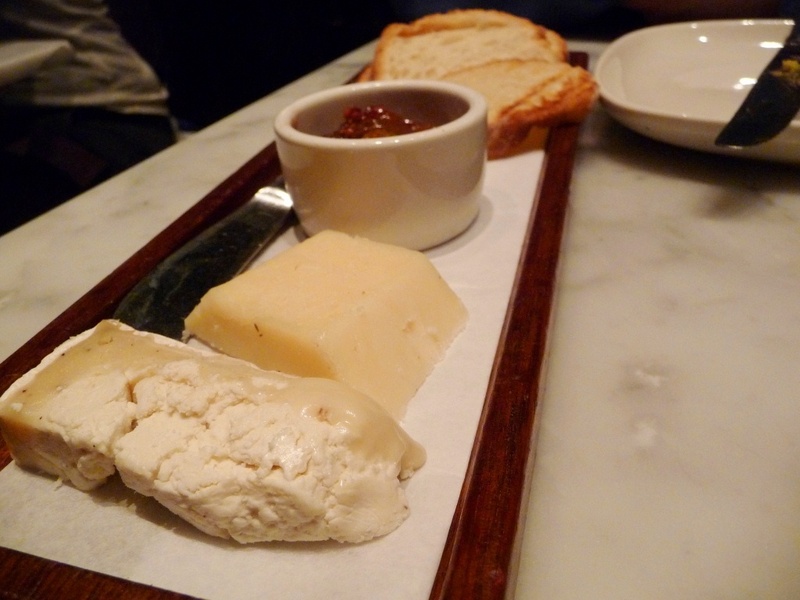 Since The Purple Pig’s motto is “Cheese, Swine and Wine,” we knew there was no choice but to indulge in a cheese course. I couldn’t help but order the “Truffle Tremor,” with a name like that. And the Chevre Noir, a goat’s milk cheddar, sounded intriguing as well. We dug in. Dessert menus arrived shortly after said “Woo,” and journalism demanded that we ordered something. Stuffed as we were, we managed to oink out an order for the Sicilian Iris ($6), a ricotta- and chocolate chip-filled brioche (below). 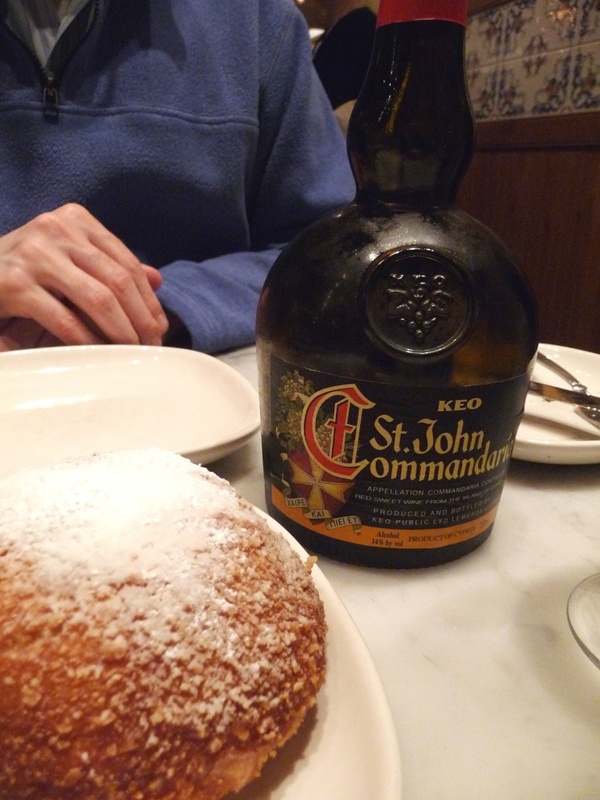 The cheerful sommelier brought a menu of dessert wines and liqueurs, and I spotted something I’d never seen before: KEO St. John Commandaria ($8), a Cypriot wine made from Xynisteri, a “rare ancient indigenous grape variety.” It worked quite well with the beignet-like brioche, tasting rather like a 10-year tawny Port. We had overordered, but considering the amount of food we packed away, neither of us felt particularly heavy or bloated — a testament to the flavorful and deceptively light cuisine of The Purple Pig. 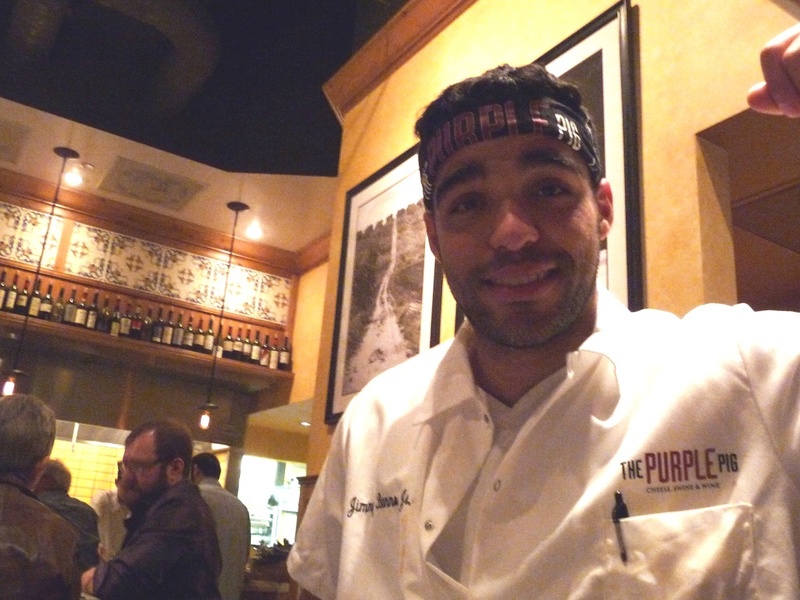 The Purple Pig: The creativity of the sommelier matched that of the chefs — the wine list presented numerous unusual and delicious options. Many wines can be ordered by the glass, quartino, half-bottle or full bottle, making it easy to sample a range of different delights. Reservations are not accepted, and the wait can be daunting on weekend evenings. Prepare to hang out with a glass of wine for a while before you get your table. 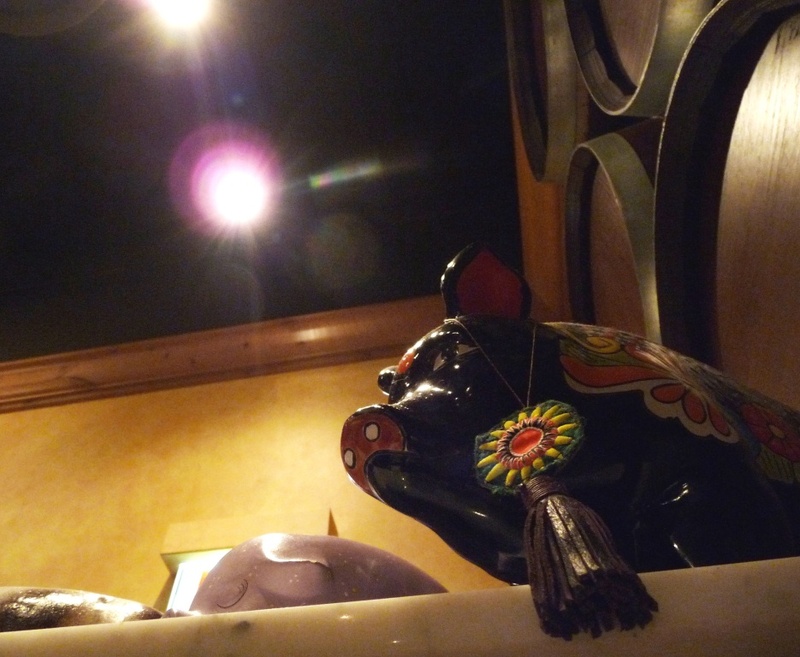 The Purple Pig would also make a wonderful choice for lunch or a shopping break. Well-priced, delicious and worth a wait. 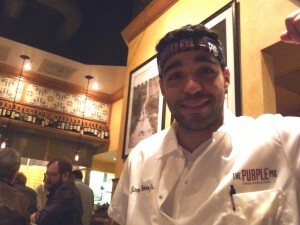 Loved the review of the food and wine @ the Purple Pig. I’ve heard of it before, but wasn’t really sure what to expect. The pictures make my mouth water and I want to try all of your recommendations.